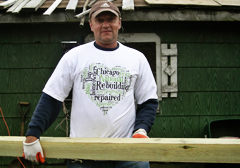 Volunteering with Rebuilding Together Metro Chicago is a great way to participate with the organization and make an impact in the homes and communities of low-income residents. There are several ways to get involved. Our sponsors are at the heart of our success. Large corporations, small businesses, and public and private nonprofit organizations dedicate their time and resources to improve the homes and communities of low-income residents. For every dollar donated, we are able to deliver $3.25 of market value home repairs. Your tax-free donation helps us assist more homeowners in need of home repairs so that they may live in warmth, safety and independence.